Details: Our Online Extravaganza sale is a great way to stock up on some Stampin' Up! stamping supplies. For one week only, you can get amazing discounts--up to 50 percent off--on over 40 products and product bundles! See below for complete offering. Orders may be placed as customer, workshop, or online orders. The sale begins Monday, November 23, 2009, 12:01 AM (MT), and ends Monday November 30, 2009, 11:50 PM (MT). Discounts range between 30 percent and 50 percent. For online orders, discounts will be shown in the shopping bag at checkout. The Distribution Center will be closed on Thursday, November 26, and Friday, November 27, 2009, for the US Thanksgiving holiday. No orders will ship on those days. Holiday Extravaganza orders may be placed by Monday, November 30, 2009; 11:50 PM (MT). 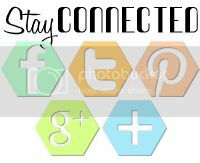 Please visit my business website, http://staceyschafer.stampinup.net to see what is available at a great discount. 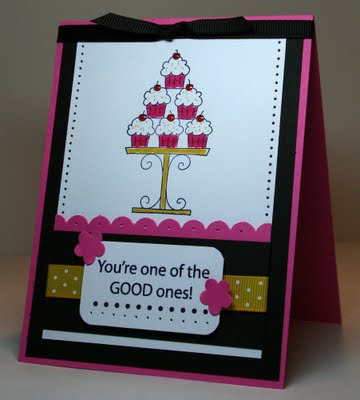 The Curtain Call Color Challenge: Act 9 Show Stopper is Krystal at Krystal's Cards & More blog with this yummy Crazy for Cupcakes card. The stack of cupcakes look good enough to eat, especially with those shiny cherries on top! Congratulations, Krystal, and thank you for inspiring us all with this darling card! 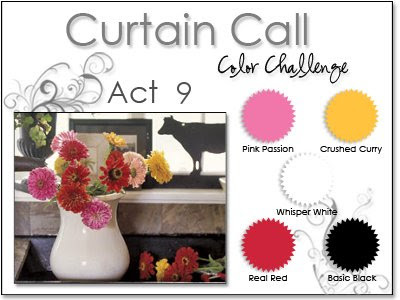 I chose to use this kitchen display from the Country Living website for the Curtain Call Color Challenge: Act 9 inspiration. After moving to the country this summer, I have been thinking of changing my home decor from a traditional style to more of an English country style. This pretty fresh bouquet really struck me today with the pop of pink, yellow and red...so fresh! The colors from the photograph are similar to Stampin' Up! 's Pink Passion, Crushed Curry, Real Red, Basic Black and Whisper White. 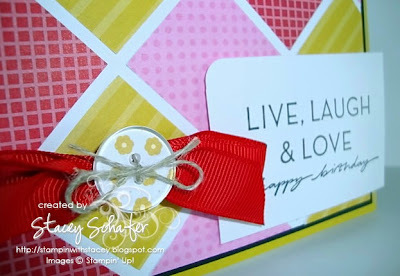 To play along in the Curtain Call Color Challenge: Act 9, simply create a papercrafted project using these Stampin' Up! colors (or similar shades from other companies), post it on your blog or other public gallery (Splitcoaststampers, Paper Craft Planet, etc.) using the keywords Curtain Call,link your posting back here, and then come back to enter your name and URL in the Mr. Linky box. You have until Sunday, November 9th at noon (CST) to enter your project. 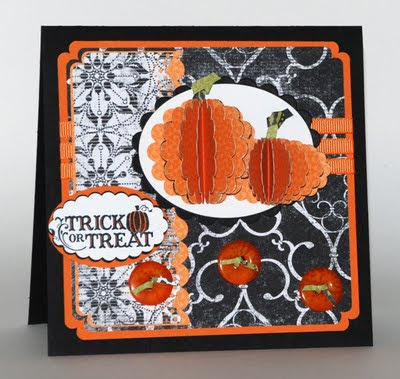 The Show Stopper for Curtain Call Color Challenge: Act 8 is.....drum roll, please... Arielle at Snappy Stampin' with her adorable card, Scalloped Pumpkins. Those scalloped pumpkins are so clever and creative...love them:) Congrats and thanks Arielle, for sharing your fun card with us! 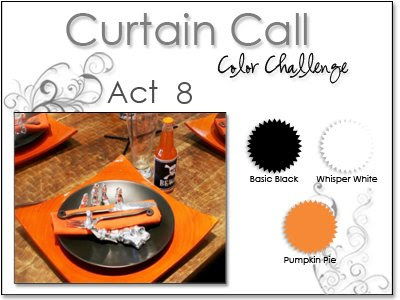 I found this Halloween table setting at Little Ant Design Entertaining Ideas blog...so cool and creative! 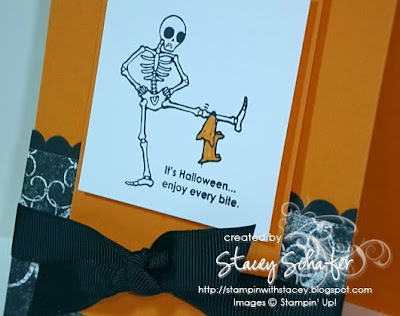 The inspiration photo has all of the classic Halloween colors...Stampin' Up! 's Basic Black, Whisper White, and Pumpkin Pie. 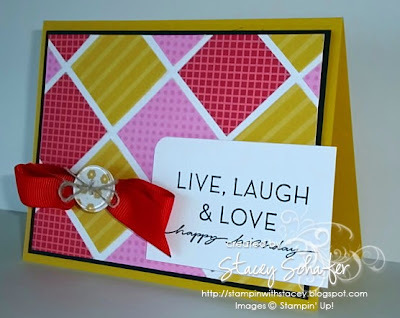 To play along in the Curtain Call Color Challenge: Act 8, simply create a papercrafted project using these Stampin' Up! colors (or similar shades from other companies), post it on your blog or other public gallery (Splitcoaststampers, Paper Craft Planet, etc.) using the keywords Curtain Call,link your posting back here, and then come back to enter your name and URL in the Mr. Linky box. You have until Sunday, November 1st at noon (CST) to enter your project. 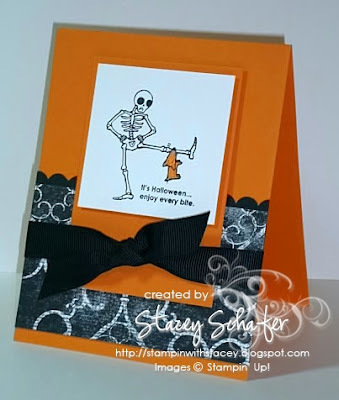 Here's my inspired card...Happy Halloween! This may be the last time (until next Fall) I use this adorable stamp set, Twick or Tweet, from the Holiday Mini. How stinkin' cute is this skeleton and mutt pair? I stamped the image with Black Stazon on Whisper White cardstock and colored the doggie in with Pumpkin Pie. I mounted the image on a larger piece of Pumpkin Pie and then adhered it over a strip of Night & Day DSP (also from the Holiday Mini) with a hint of a Basic Black scalloped edge. The card base is also Pumpkin Pie and wrapped around with Basic Black 5/8" Grosgrain tied into a centered square knot.